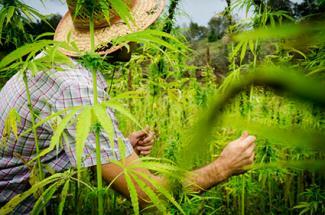 Marijuana or cannabis has been cultivated for several millennia for its edible seeds, oil, fiber, and, of course, for its psychotropic and physiologic effects. The idea of growing marijuana plants is quite enticing as it can potentially provide you with a regular supply of buds for medical or recreational use. Just be sure you follow state laws regarding medical and recreational growing and use. Cannabis prefers a warm climate and a sunny location. It grows wild in many tropical and subtropical areas, often becoming large like a tree in just one year. But this fast-growing annual can come to buds within four months of sowing the seeds, so you can start it in spring to get a fall harvest in USDA hardiness zones 7 to 11. It is quite feasible to grow cannabis plants anywhere in the world, provided you are living in a country or state where it isn't illegal to grow this annual. 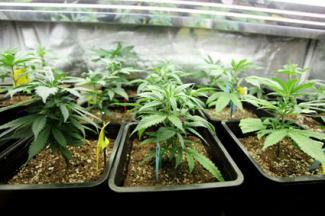 The key is to choose between outdoor and indoor cultivation depending on the duration of your growing season. The cannabis grown for fiber, edible seeds, or seed oil does not develop enough cannabinoids to provide any medical benefit or mental stimulation. The main varieties used for these purposes are Cannabis sativa and Cannabis indica. If you intend to grow marijuana as a relaxant, look for Cannabis indica. It helps in the management of tremors and pain due to multiple sclerosis. Cannabis sativa is used as an appetite stimulant and helps control nausea during chemotherapy. There are hybrids that offer a combined effect too. Start the seeds indoors several weeks before spring, but transplant the seedlings only once the days lengthen and you are free of night frosts. Sourcing cannabis seeds is a bit tricky. If you are not able to find a nursery that sells clones, your best bet is ordering cannabis seeds online. Soak the seeds for two to three days before sowing. Start them indoors in a sterile medium. Just make a hole in a cupful of coco peat or peat moss and drop a seed, cover it up and water. Keep the medium evenly moist. Once the seedlings emerge, keep the pots under bright grow light. Low light conditions result in lanky plants. Choose a sunny location. These fast-growing plants are greedy for sunlight, so give them as much as possible. A minimum of six hours of direct sun is essential. A southern exposure would be the best. Prepare the bed by digging deep and wide. Good root run ensures healthy plants with good branching habit. If you have too much clay, add some sand or perlite to promote drainage. 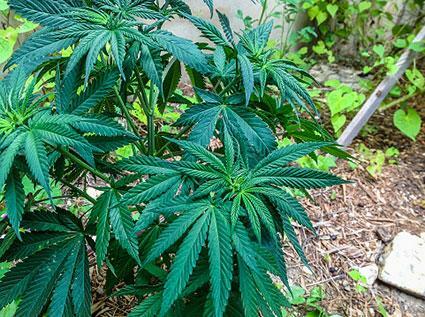 Since you are going to smoke the buds, stick to organic fertilizers as far as possible. Manure, guano, and vermicompost are excellent choices. The pH should be kept around 6.5. Ensure regular watering for vigorous growth. Nip the terminal buds to promote branching and increase yield. As the days get shorter and colder in fall, bud production gets initiated naturally. Growing cannabis indoors has many advantages. Besides protecting the plants from unexpected frosts and other vagaries of nature and pests, you can provide specific growing conditions tailored to their needs during the vegetative phase and bud set. Sow them similarly to outdoor cultivated plants; move them to a bigger container as needed when they stay indoors. When you grow them indoors or in containers outdoors, you have option of using different media. Good quality potting soil or soilless media, such as coco peat, can be used. Cannabis can be grown hydroponically too. Choosing the right growing equipment is essential to success and a solid yield. There are many companies to choose from, like Fullbloom Hydroponics, that provide everything from small packaged setups to commercial equipment and light deprivation greenhouses. All cannabis plants growing in sufficient light will eventually produce buds, but when you grow them indoors in controlled conditions, you can do a thing or two to encourage bud production. Lower the temperature by a few degrees. Reduce the light supply to less than 12 hours a day. Feed the plant with high phosphorous fertilizer that is low in nitrogen. There is a dwarf variety known as Cannabis ruderalis which can be harvested in just three months; it is not sensitive to the light cycle. Whether you grow marijuana outdoors or in, you'll need to provide light, water, fertilizer, and temperature care for your plants. During the vegetative growth phase, the light requirement is high. When growing them indoors, it is best to invest in special grow lights for cannabis. Setting the lights to an on and off cycle of 18/6 is ideal since the plants need a rest period of at least six hours. Complete darkness should be ensured during this off period. That is why grow tents are particularly good for growing cannabis indoors. When growing cannabis outdoors, be sure that plants have at least six hours of southern sun exposure. Cannabis plants are drought tolerant to some extent, but they appreciate a steady supply of water. Water stress can cause some plants to become male. Ensure good drainage by adding gravel or perlite to the potting mix (or soil outdoors) and providing plenty of drainage holes. Cannabis roots like good aeration. Water logging should be avoided at any cost. Special care should be given to feeding cannabis plants whether grown indoors or outdoors. Overfeeding, especially in the first few weeks, can negatively affect bud set later on. Choose the best fertilizer for the type of plants you are growing. Cannabis plants do not like cold, especially at night. Maintaining a uniform temperature helps healthy growth, but don't make it too warm for them. The ideal temperature for indoor cannabis cultivation is between 70 and 75 degrees Farenheit. It helps if you can provide a bit of air movement around the plants with a fan. Most outdoor varieties can tolerate temperatures down to 50 degrees Farenheit. Cannabis plants come male and female; the males have very little amount of active components. The usual practice is to remove the male plants as soon as they are identified. You don't want to waste your resources on then. Elimination of males should be done before their pollen sacs open because they can pollinate the females and cause them to set seeds. When the female plants direct their energy to seed formation, it reduces the production of cannabinoids. Both male and female plants look similar; you can't tell them apart until they are four to six weeks old. Watch out for the first buds. They appear like small balls where the leaf joins the stem, but the female flowers will have two thread-like pistils hanging out. Some plants may turn out to be hermaphrodites, carrying both male and female flowers. Since these male flowers can pollinate not only the females on the same plants but corrupt all the other female plants, hermaphrodites should be eliminated as well. Once the flowering tips of the branches have filled out with buds, the hairs on them, called trichomes, will indicate when you should harvest the buds for the desired effect. The trichomes first turn translucent and milky. You can harvest the entire bud head, with the bud leaves included, for medical use. If you wait a bit longer, the trichomes will start to yellow. This stage is ideal if you want a milder psychotic effect. For a stronger smoke, postpone the harvest until all the trichomes change color. Hang the entire bud head upside down to dry it out. It may take up to a week or more depending on the temperature and humidity. Curing for another two weeks by slow drying it inside a brown paper bag mellows the taste. Store the buds in dry containers. It is essential to keep track of the laws regarding cannabis cultivation and storage. 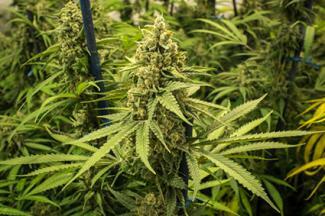 There are restrictions on transporting marijuana and the number of plants that can be grown at a time even in states where it has been legalized.